Coverage: Updates and daily reports on the BBC Sport website. 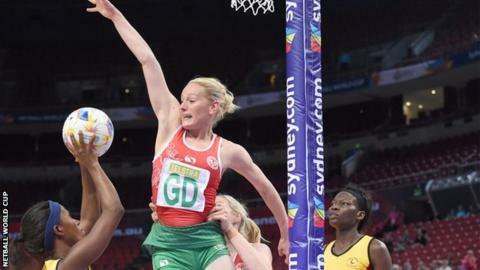 Wales produced a brilliant final quarter to edge Uganda 49-47 and finish top of Pool D with a 100% record at the Netball World Cup in Sydney. Trish Wilcox's side advance to a pool containing England, South Africa and holders Australia. Wales were in front until the third quarter, when Uganda took a 39-35 lead. But a faultless shooting display in the final period by Chelsea Lewis and Emma Thomas, who hit all 14 of her shots in the game, pushed Wales to victory. Wales are back in action on Tuesday when they face South Africa at 03:20 BST. Uganda also qualify as runners-up and in the next round will face New Zealand, Malawi and Jamaica, who beat Scotland 71-24 in Monday's later game. Wales often found their mid-court passing disrupted by the good coverage of the Uganda players, but wing-attack Bethan Dyke and centre Kyra Jones - who sat out the third quarter - worked tirelessly to feed their shooters. Captain Suzy Drane and vice-captain Rosie Pretorius needed treatment for leg problems during a hugely competitive match. Wales - ranked eighth in the world - will hope the pair have suffered no lasting effects as they head into a difficult Pool F against world number one Australia, third-ranked England and South Africa, who are ranked fifth. Earlier in the tournament, Wales opened with a 59-52 win over Fiji before beating Zambia 71-44.